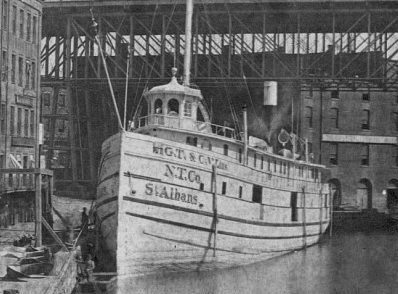 Built and launched in 1868 from Cleveland, Ohio, the St. Albans was a proud steam screw with a length of 136 feet and a beam of 26 feet. She saw just over a decade of service hauling passengers and cargo throughout the southern Great Lakes. In January of 1881, the St. Albans was on a short journey from Milwaukee to Ludington, MI with a load of flour and livestock. Just under two hours into the voyage it was discovered that the St. Albans was taking on water and the boilers were put out by the rising levels. The leak was found to be a hole in the port bow and despite the crew’s efforts to patch it, the St. Albans went down. The crew was able to safely abandon the vessel prior to her going under. That April, fishermen reported snagging their nets on her wreckage. Currently, the St. Albans lies in 165 feet of water and is mostly intact. She is an amazing wreck for advanced technical divers to explore and hone their skills on. We visit the St. Albans from Milwaukee.